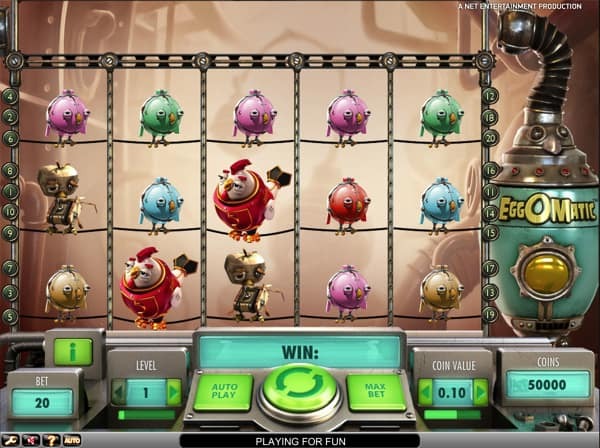 EggOmatic is a totally unique and incredibly fun addition to the Net Entertainment house of online video slots. You’ll find it difficult to stop spinning the reels thanks to the gorgeous graphics, stunning animations, and a never-ending bonus game. EggOmatic is presented on 5 glorious reels, three rows, and features 20 fixed pay lines. The slot game doesn’t feature any separate bonus features but does include a wild symbol and a top paying jackpot bonus worth 1,000 coins up for grabs. The background takes place in an egg factory where the lead rooster invented the machine by the name of EggOmatic to produce more eggs. You will notice the EggOmatic machine on the left-hand side of the reels while a conveyor belt surrounds the reels. The higher valued symbols are various designs of robotic chickens including a red and white rooster with a star tail, a white and green chicken with massive eyes, a lavender hen with a blue heart on her chest, a blue rooster with a propeller-shaped tail and a sad little brown chicken. The lower valued symbols are presented with little round chickens in different colours including brown, blue, green, lavender and red. Before you turn on the machines and create a mass production of different eggs, you first need to spend some time on finding the perfect betting options to suit your playing style. The coin denominations range from as little as £0.01 and can be increased to £1.00. The minimum bet you can place on a single spin is £0.20 while the maximum you can bet on a single spin is £200.00. The big blue chicken holding a wild sign represents the wild symbol and will stand in for all other symbols, catch all the unique eggs and will activate them once caught. Spreading Wild Egg: Catching this unique egg will transform the surrounding symbols into wild symbols to create more winning opportunities. Free Spins Egg: Catching this egg will award you with a random number of free spins ranging between 7 and 50 free spins. Free spins can also be re-triggered. Coin Win Egg: Catching this egg will award you with an instant cash prize that’s dependent on your total wagered amount. It can pay anywhere between 500 and 2,500 coins. EggOmatic provides stunning animations right from the intro movie to the special way the characters are dispensed and zapped when featured in a winning combination. This video slot has a medium to high volatility level, providing amazing pay outs when you spend some time on the game. The Return to Player is set to 96.50%, giving you a marvellous gaming experience when you enter the egg factory. EggOmatic is available at multiple online casinos that have games from Net Entertainment. Here you will be able to find a couple of recommendations and also find a demo version of the game.